Having spent at least one of my Wonder Years riding my Sting-Ray on the incipient San Diego Freeway, I’m fully aware that one of life’s great joys is riding your bike on a big road that’s supposed to be the sole domain of automobiles. That’s the key draw for the the City of Long Beach’s Beach Streets events: A chance for skaters, bikers, scooterists, walkers — just about every form of transportation other than the vehicles that normally hog the road — to leisurely enjoy a day cruising around enjoying different parts of town by taking over big boulevards, all deserted by all autos, even parked cars. The Saturday edition of Beach Streets was something a little different. It was held in the twilight hours, between 5 and 10 p.m. on and around the Downtown waterfront’s Shoreline Drive. The event drew a relatively small crowd — the city estimated the crowd at 7,000 throughout the day. Others weren’t quite as generous. And while participants no doubt had a grand time at the event, some restaurant owners were, as is always the case when Shoreline is shut down, angry about what they termed a considerable loss of business. The crowd consisted of 1,800 to 2,400 people “at the most,” said Schneiter, whose restaurant won first place at the Long Beach Barbecue Fest on the previous weekend (over competition that included local powerhouses Robert Earl’s BBQ and Bludso’s Bar & Que). Gladstone’s owner John Sangmeister was similarly miffed, though he would not go on the record. He peppered me with messages Saturday night that included interviews with the owners of other Shoreline restaurants talking about similar casualties caused by the street closure. It is a dicey problem for the city and businesses. One can argue that sporadic closures of Shoreline (and one can also argue that Shoreline closures are a bit more frequent than sporadic) are part of the cost of doing business when your business is accessible by the most impressive and photogenic of all Long Beach streets. It’s a stretch of road that doesn’t exist solely as a means of delivering people to your Shoreline area businesses. 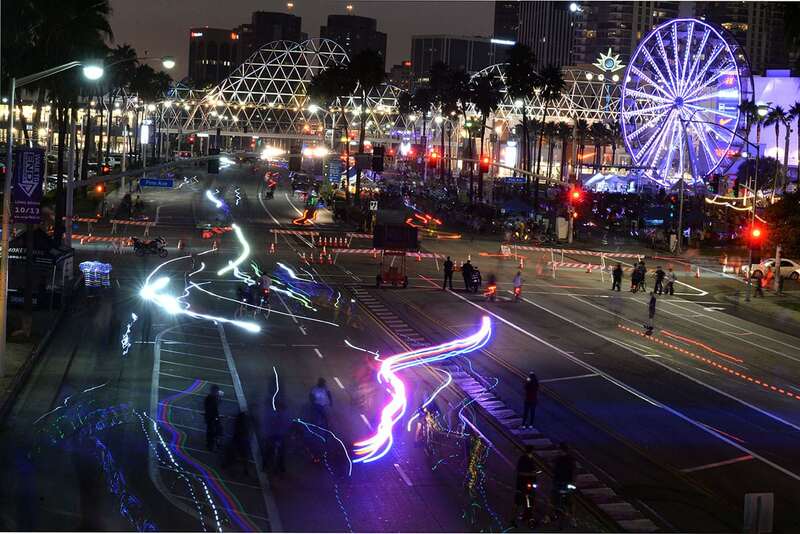 Rather it’s a showcase feature of the city, and a big part of the Grand Prix, the Long Beach Marathon, Long Beach Pride and numerous festivals, as well as the recent Amgen bike race, for which the street’s closure on Mother’s Day also drew the wrath of local restaurant owners. Beach Streets has been an undeniable and unqualified success in its half-dozen earlier iterations in mercantile districts, including Anaheim Street in the Midtown section of the city; Downtown Long Beach and beyond, in which Broadway was closed between Pine Avenue all the way to Euclid Avenue in Belmont Heights; in the neighborhoods north of Cal State Long Beach; and two in the Uptown/Bixby Knolls neighborhood. As executive director of the Bixby Knolls Business Improvement District, Blair Cohn was heavily involved in the Beach Streets events in Bixby Knolls, and he and his wife and daughter have visited nearly a dozen CicLAvia events in LA, which are similar but more sprawling events, as well as most of the Long Beach Beach Streets. He acknowledges that there were some problems with Saturday’s Twilight Beach Weeks. “As an events person I never want to see businesses get hurt by an event, and it definitely wasn’t a record crowd, but I’m sympathetic to organizers for putting it on. I never want to be the person who says to not try something. “But it is a dilemma, having it on Shoreline,” said Cohn, who is also on the city’s Economic Development Commission. “If this was a one-off event and there was no Grand Prix, no marathon or anything else, you’d say this was a great showcase for the area. But if you ask business owners down there, you’d get another answer. “The organizers did a good job. It was something the city wanted to try, they sure made it look good, and the folks attending were having fun,” he said. “My family and I had a great time. We bought some clothes for our daughter, played in the arcade, visited friends at the Auld Dubliner.